Why Katris Lynx Is Better Than A Scratching Post. 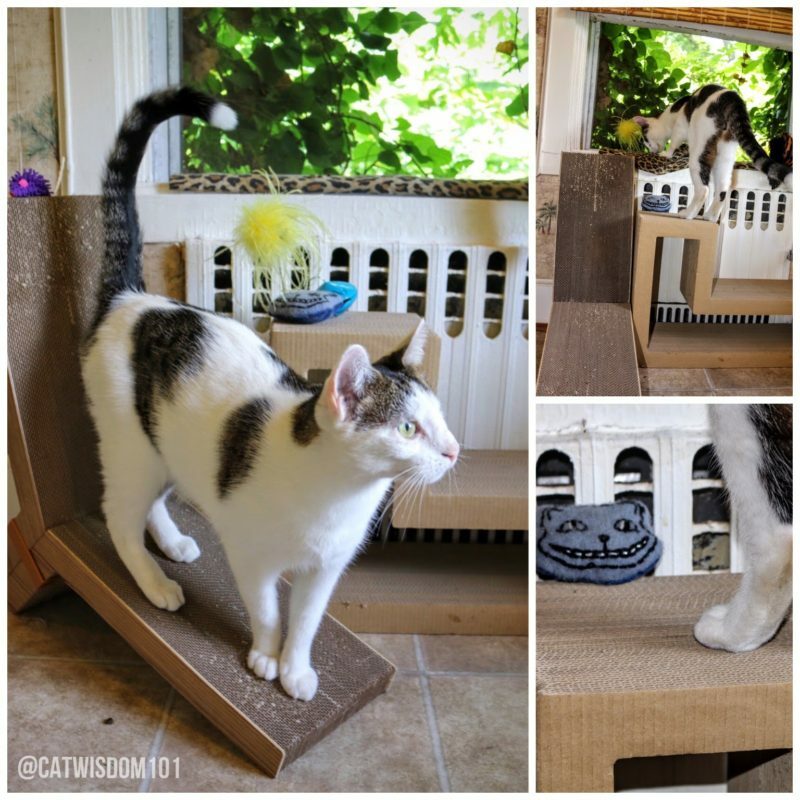 We’re taking break from Mondays With Merlin to share news about a scratching post system we love. The best thing about blogging and reviewing products since 2011 is the perspective of time. There are very few products that stand up after vigorous use and Katris is one. The California-based company launched in 2014 and Merlin did a pretty, darn awesome Katris review soon after. Seeing Merlin climb the modular cardboard units, so fit and nimble at age 19 is astounding. It’s also a nostalgic look back at the passage of time. 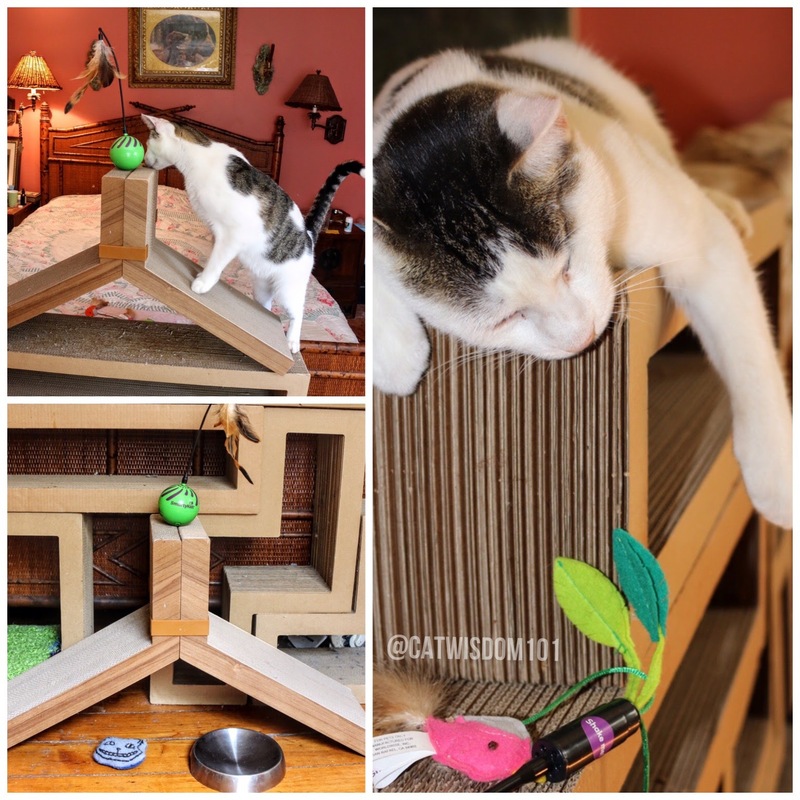 We loved the flexibility of the stacking, interchangeable units since all cats need environmental enrichment to be happy and healthy. They need spaces to play, scratch, stretch, hide, perch, nap and climb. Katris served all of the above and then some. So, how did Katris, which is made out of cardboard, fare over time? We’ve tested a few other cardboard type scratcher/loungers. They tend to shred and turn into a confetti mess within weeks or months. The regular cardboard turned flaky like uncooked oatmeal. The Katris is shred resistant. After being moved numerous times and used daily, there are a few dings and dents but nothing significant. I have new respect for the recycled, super sturdy cardboard. It’s only in retrospect that I realized what an important role Katris played in our lives. It functioned practically as furniture cats and humans used without impunity. We have lots of antiques and having a safe surface for scratching is a relief for all concerned. Most older cats need stairs to help climb up to a bed or favorite window perch and Katris did the trick. It was easy to move or re-configure as our needs changed. The biggest takeaway though is about change. The only constant is change and as pet parents, it’s up to us to adapt our cats’ environment and their needs. Katris proved sturdy enough to sit on and store things in. The cubby hole spaces filled with cat toys, books but I never could have imagined the new uses for Katris in the past year. A foster cat arrived and a few Katris pieces were moved to the “safe room” aka the guest bathroom. The Katris was handy storage for subcutaneous fluids and other health supplies for Merlin, a CKD kitty. When Radish died the Katris arrangement in the bathroom transformed into memorial shrine. 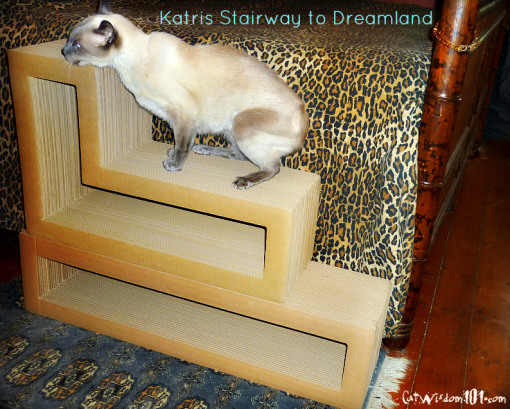 When Merlin could no longer navigate stairs, we knew his time to move on was near and we moved a new Katris design to the foot of the bed. When our foster cat Nou Nou was feeling insecure from all the changes, she didn’t want to eat with the others so we placed a bowl on the new “bar”. 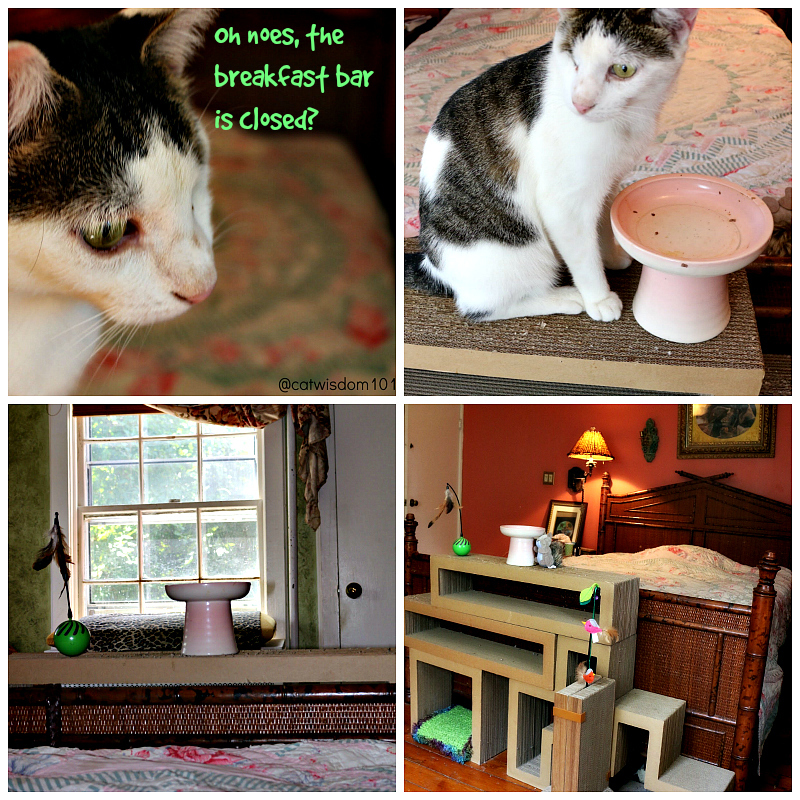 The height of the “breakfast bar” was the perfect height to gain distance from the other cats. Cats always feel more secure observing from a higher perspective. Nou Nou is fixated on the Katris “breakfast bar” and won’t eat anywhere else. It was never meant as a long term solution and I recommend placing a waterproof mat underneath if you want create your own elevated dining spot. The cat meowdel I could get on on short notice was Odin. He is worth his weight in catnip for putting up with a photo shoot with the AC not working. Yes, he got extra treats. Merlin and I used to always have breakfast in bed ( ah, the joys of working from home) so a breakfast bar is not too crazy cat lady, is it? I wasn’t sure Katris could improve on purrfection but they did. The two affordable, durable scratchers have an elegant wood facing and I couldn’t wait to play with them. I decided to make a new Bird and Squirrel TV observation deck. Remember: the only limit is your imagination. The color is a neutral beige but you can add a pop of color with a pillow, towel or my favorite recycling: an old wool or cashmere sweater. Hide some treats and place some catnip toys in unexpected places. Have fun and make it your own scratcher Shangri-la. And That’s Why Katris Lynx Is Better Than A Scratching Post. Odin, all tuckered out after playing “king of the castle”. 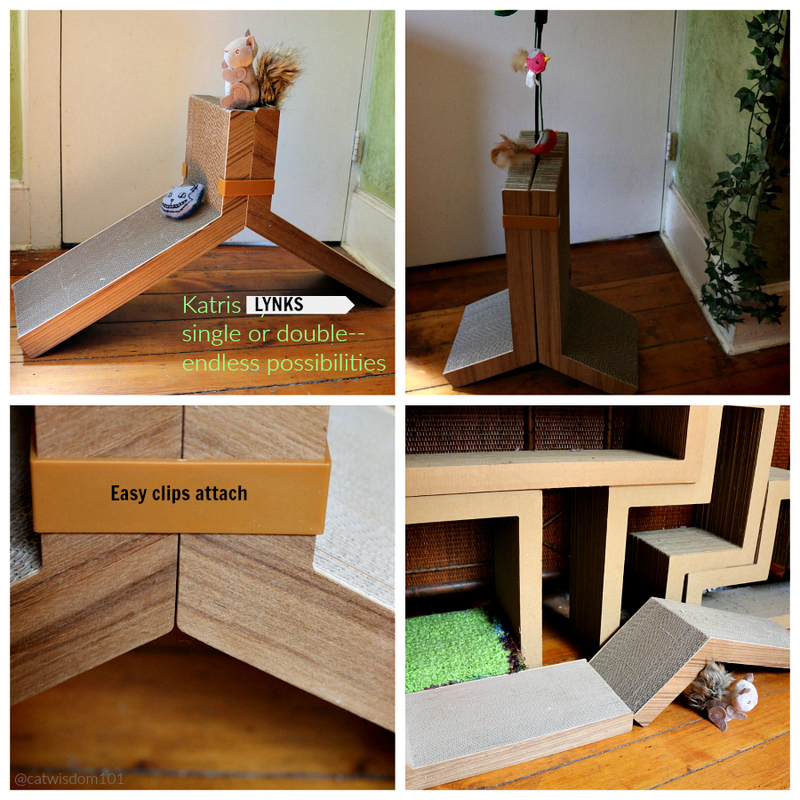 Katris will donate 3% of all Lynks pre-order proceeds to the Paw Project. The nonprofit aims to help end the practice declawing cats in the U.S. and we’re big supporters of the cause. Follow Katris socially to keep up todate on their news and offers. FTC disclaimer: This is a sponsored post but we only share content we feel is of value to our readers. The opinions expressed are 100% our own. A truly functional piece of “furniture/equipment” with a practical use over and above scratching! I love the fact it can “morph” into different shapes to suit different situations with different cats…….and it seems super sturdy as well. Thanks for the review…….Katris is the answer! I would LOVE to get a Katris. Maybe if the price is right we will. I have to agree the thing looks awfully good. We have a couple of the flat type around all the cats use and it is getting to be a shredded mess. One of the cats Minnie, use it when she is ticked off at the oldster Ozzy and she will tear it to pieces sometimes. Cool product, cool give back! My kids are starting to discover the joy of cardboard. Finally carboard? They didn’t like boxes? They love boxes to play in but never shredded until I got some of the flat cardboard scratchers. Any size and easy to move. 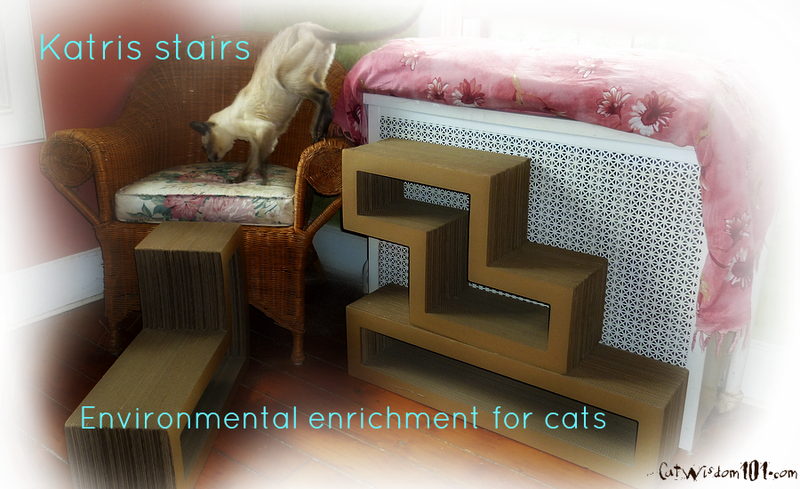 We love how you were able to adapt them for stairs for Merlin. We remember Jan using misc. to make “stairs” for Missy when she got old. Jan, they worked well and it’s a good reminder to help us be mindful when our pets need a “leg up”. The Katris systems are really cool! Summer, I can see you posing on one! Wow, a genius invention. Love the old radiator. So good to see Merlin and Odin enjoying this! Jeff Lin the founder/inventor of Katris is brilliant. Ha, about the radiator. This house was built in 1867 but no clue when those old rad were installed. That is really cool. Lynks would make great scratching post and I love that they donate their proceeds to Paw Project. Knowing how you love to catify, they would fit right into your style! Wow, we didn’t know those existed! looks like a great thing to have on our wish list. They’re still pretty new and the Lynks were just announced today in a press release. We’ve always loved the Katris, though we don’t have any right now. 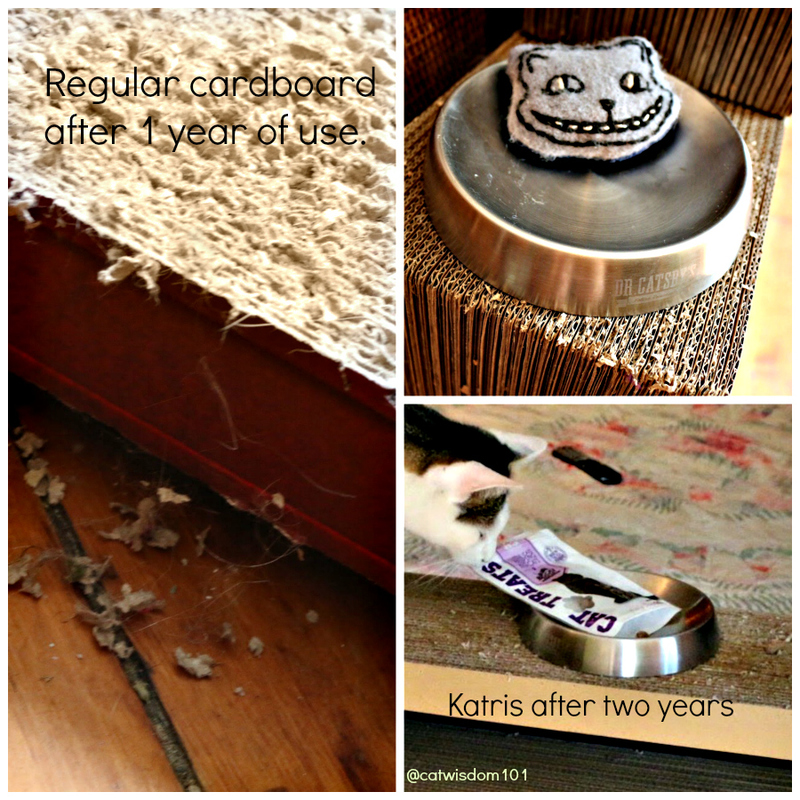 Wally loves to scratch cardboard and when the cardboard scratchers we do have wear out, we’ll check out Katris. We love that they give back to the animals. Knowing how Wally does a number on cardboard, you won’t have to wait long! Yes, we’re big on supporting those who give back to animals. Those are really cool, and we really love how some of the pre-order proceeds go to the Paw Project. 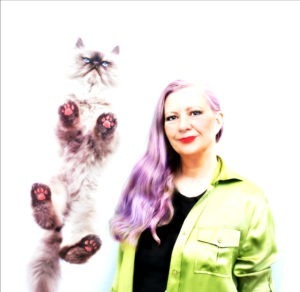 Paws up to constructive cat scratching! Yes to constructive cat scratching! Btw, the Paw Project link goes to a page where everyone in the U.S. can show support.